"This nest has three eggs in it. I’ll put them with the others," Curly, the chipmunk, giggled. She ran into the woods with the eggs in her paws, dropping the nest carelessly on the ground. "I’m going to have a feast tonight of eggs, beetles, grasshoppers and ladybugs. I can hardly wait." After jumping over fallen tree trunks, darting around raspberry bushes, and pushing through piles of fallen leaves, Curly found herself in a clearing. "Ah, there’s the rest of my supper." She dropped the stolen eggs on the ground next to the assortment of bugs. "I can almost taste those eggs now. They’ll be absolutely delicious!" "Curly, it’s not nice to steal the bird’s eggs. One of these days you’re going to get yourself into trouble," a small mouse warned. "Go away, Murdock. I’m a chipmunk and I’ve got to eat. I love eggs. They’re my favorite. Besides that, the birds can lay more of them," Curly argued. "What about their nests? You toss them on the ground. It’s hard work for the birds to build those. They have to gather twigs, leaves, bits of wool, and fluff off the ground," Murdock frowned. 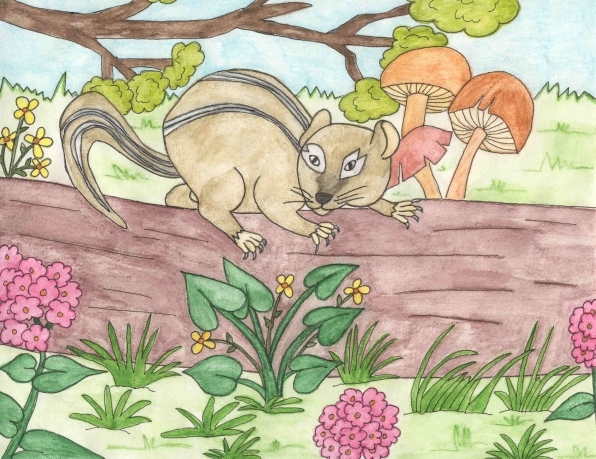 "You’d better go away or I’ll eat you too," Curly snapped, and chased the mouse out of the clearing. That night Curly feasted on roasted grasshoppers, ladybugs, beetles, and several scrambled eggs. "Delicious!" she laughed, wiping her mouth with her furry paw. The next morning she was feeling hungry again. "I quite enjoyed those eggs last night. I think I’ll have that for supper again tonight," the chipmunk said, rubbing her tummy, "and some more bugs too. They were very tasty." Murdock watched from behind a bush as Curly ran about the woods, coming back now and then with a few beetles. She dropped them in a pile. A while later she brought back six small, white eggs. "Ah, quail eggs," she giggled, dropping them on the grass next to the beetles. Murdock shook his head. 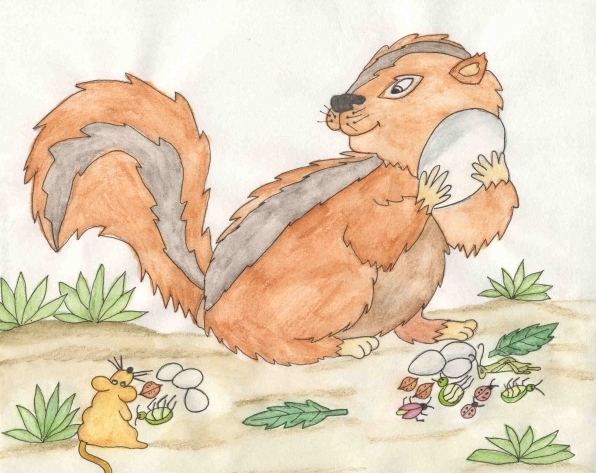 "One day she’s going to get herself into a lot of trouble, stealing other animals eggs." He sat down in the grass and waited to see what Curly would do next. In the late afternoon, she came into the clearing carrying a huge egg. Murdock jumped up and gulped. He ran into the clearing, shouting, "Where did you get that?" "I found a nest on the ground. I’ve never seen such a big egg before. I can’t wait to eat it," Curly said, her eyes bulging with delight. "That’s a huge egg. What if it belongs to a crocodile?" Murdock said. "They build nests on the ground. It will bite your head off." Curly started to laugh. "They don’t have crocodiles in Scotland, silly mouse." Murdock said, "What if it belongs to an ostrich? They’re big and they’re fast and can peck you to bits." "There are no ostriches in Scotland, silly mouse," Curly chuckled. "What if it’s an elephant egg? It will find you and step on you and squish you," Murdock said. "Elephants don’t lay eggs, silly mouse, and besides that, there are no elephants in Scotland," Curly scoffed. "Something laid that egg and sooner or later it’s going to come looking for it," Murdock warned. "I’ll just have to eat it quickly then, won’t I?" Curly answered. She started looking at all the bugs lying on the ground, when she noticed that the leaves in the trees started to rustle. "What’s that noise?" "I’m getting out of here. Whatever it is has come for its egg," Murdock said and ran behind a tree to hide. "Who’s out there? You can’t have my egg!" Curly shouted. Just then a huge owl swooped down from the branches of an oak tree. "Give me my egg," it screeched. "HOOT! HOOT! HOOT!" Curly stood in horror as the sharp talons of the owl came right at her. She thought the owl was going to carry her off and eat her. "Give me my egg!" Curly was so afraid that she dropped the egg on the ground and scurried into the woods. The owl picked the egg up and flew back to her nest. When she finally thought it was safe, Curly crept into the clearing, watching the trees for the owl. Murdock followed. "I told you so. Nobody wants their eggs eaten by a chipmunk. You’re lucky the owl didn’t hurt you with its sharp talons and take you home to eat for supper." "You’re right. I thought it might. I think from now on, I’ll stick to grasshoppers, beetles and ladybugs," Curly sighed. "It’s much safer; not as tasty, but safer." And that’s exactly what she did.